Semantic values for generating static semantic ASTs. Each SValue has a pointer to a partly-constructed AST. In general, the parent pointers in these AST nodes are not initialized because many of these nodes are being shared across multiple subtrees. ROSE's instruction semantics framework relies very heavily on node sharing, but the AST was not designed for this. Do not expect AST traversals and analysis to work correctly for ASTs pointed to by an SValue. But never fear, the SValue's AST will be fixed when it's actually attached to an instruction node. Definition at line 72 of file StaticSemantics2.h. This SValue will be used only for its virtual constructors and will never appear in an expression. Definition at line 99 of file StaticSemantics2.h. Instantiate a data-flow bottom value. Definition at line 104 of file StaticSemantics2.h. Undefined values end up being a SgAsmRiscOperation of type OP_undefined which has a single child which is an integer identification number. This allows two such nodes in the AST to be resolved to the same or different undefined value by virtue of their ID number. Definition at line 113 of file StaticSemantics2.h. Unspecified values end up being a SgAsmRiscOperation of type OP_unspecified which has a single child which is an integer identification number. This allows two such nodes in the AST to be resolved to the same or different unspecified value by virtue of their ID number. Definition at line 122 of file StaticSemantics2.h. Definition at line 127 of file StaticSemantics2.h. Referenced by boolean_(), and number_(). Definition at line 132 of file StaticSemantics2.h. Definition at line 135 of file StaticSemantics2.h. Definition at line 138 of file StaticSemantics2.h. Definition at line 141 of file StaticSemantics2.h. 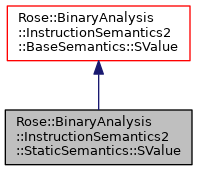 The new semantic value will have the same dynamic type as the value on which this virtual method is called. This is how 1-bit flag register values (among others) are created. The base implementation uses number_() to construct a 1-bit value whose bit is zero (false) or one (true). Definition at line 144 of file StaticSemantics2.h. Definition at line 147 of file StaticSemantics2.h. Definition at line 154 of file StaticSemantics2.h. Promote a base value to a static semantics value. Definition at line 161 of file StaticSemantics2.h. Definition at line 169 of file StaticSemantics2.h. Definition at line 174 of file StaticSemantics2.h. Definition at line 183 of file StaticSemantics2.h. Definition at line 187 of file StaticSemantics2.h. Definition at line 191 of file StaticSemantics2.h.